Extend Your Home with a Triple Glazed Conservatory. Triple glazing is a very easy and efficient. The Advanced Group specialize in this method and overall has been very successful. We help with the supply of energy by using UPVC Windows with 3 insulating layers of glass with two air spaces. These two gaps of air space help with the reduction and loss of condensation and helps slow down any heat loss that might occur. Being able to extend your home with a Triple Glazed Conservatory can help you maintain an efficient way of conserving energy. When you extend your home with a Triple Glazed Conservatory you are ensuring that your home is more secure and weather efficient. The Advance Group is dedicated to ensuring the safety and the efficiency of the building structure. They make their windows, doors, and conservatories from innovative Advanced 70+ profile system. It is known to be the best involving Triple Glazing Energy Efficient methods. It is becoming more popular and has become a first choice among the people with environmental concerns. If you are concerned about the environment and how it is being effected then this will be the choice for you. That is why a lot of people are now starting to use Triple Glazed conservatory instead of the Double Glazed Conservatory. That is why it is such a good idea for you to extend your home with a Triple Glazed Conservatory. Triple Glazing involves a highly engineered window system featuring different profiles. They contain systems with PVC-U than many other systems that are out there. With the design you see it is built to the relevance of most building standards and codes. 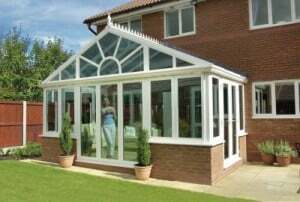 It tries to meet the buildings standards and aim for the best security options that are needed to ensure a more secure structurally sound conservatory. The design also ensures the Advanced 70+ window is the most prominent and thermally efficient window offered in Scotland as of right now. Triple Glazed conservatories are very specific and must have a U-valve of 1.6 or lower. A Triple Glazed conservatory has an Ultraframe high performance roof that is combined with extra flooring and wall insulations to help provide a more energy efficient structure. Combined on top of that the Advanced Group’s famous Triple Glazing helps ensure that it stays more energy efficient and structurally sound. When you extend your home with a Triple Glazed Conservatory you are adding style and a new look to your home. There are many different layouts that can be considered and the payments are flexible. When deciding if you want to extend your home with a Triple Glazed Conservatory you will want to make sure that you survey the property to make sure it is up to regulations and building codes. Being energy efficient is important and will also give you a chance to enjoy the sun all year around. The Advance Group are the best when installing the energy efficient Triple Glazed conservatories. It is easy and they are prepared to make sure that the conservatory meets all building regulations and building codes. Triple Glazed Conservatory – Extend Your Home. Give us a call at The Advanced Group today on FREEPHONE 0500 338 488 to find out more and to get a FREE consultation with a helpful member of our team. Or Simply complete the enquiry form on this page.